Categories and tags: they're among the first things you discover when you start using WordPress. And if you're reading this, ​you've probably got some system or other, for how you apply them to your content. But how much do you really understand about categories and tags? How exactly are they different from each other? And how should you use them to get the most SEO benefit and make your website engaging and easy to navigate? In this post, you'll discover everything you could reasonably want to know (plus a bit more) about categories and tags. First things first: what do categories and tags do, exactly? Both of them can be applied to blog posts, but not pages in WordPress. And both of them create archive pages. That is: pages under which all the posts with a given category or tag are listed. Here's an example of a category archive on this website. And here's an example of a tag archive. For website visitors, it groups together related content. It's a navigation feature. For your content, it automatically creates pages that internally link related posts together. This is a search engine optimization feature. In function, there's only one real difference between categories and tags: categories can have structure (with as many levels of sub-categories as you want) while tags can't. If you have a parent category and sub-categories, the parent category lists all of the content assigned to itself as well as all of the content in all of its sub-categories. In most themes, categories are displayed in the post. In most good themes, tags are not displayed, because tags are not great for navigation (on your website - we're not talking about Twitter or Instagram, here). Alright, with the basics covered, let's take a closer look at everything you need to know about categories. No orphans: you should not have any categories that have only 1-3 pieces of content in them. Generally, less is more: lots of categories are overwhelming and less useful for navigation. The number of categories on your site should be proportional to the amount of content. Post once a week? 5 categories are plenty. Post 15 times a day? More categories probably help. Keep categories clearly distinct from each other. "Camera Gear" and "Photography Tips" are two clearly separate categories. "Camera Gear" and "Equipment" are not. For most websites, it's better to have categories in a narrow niche​ than to try and cover too many widely different topics. I recommend using clear language that is either action oriented or benefit oriented, for your category names. The category name shows up as a clickable label on your site, so copywriting rules apply. For example, instead of a generic category name like "Traffic Generation", go with a name like "Get More Traffic". These are the same categories in both cases. Example A is generic and widely approachable (although not particularly appealing). The terms in example B will only make sense to people in a certain segment of the fitness market, but will resonate with them much more strongly. You can give your category page an SEO/meta title that contains whatever keyword you want to target. It's good practice is to write your site content for humans and your meta content for search engines. You won't rank for generic terms like "muscle building" anyway. Actionable, benefit oriented category labels are better terms to target for SEO. 1 post, 1 category: apply only one category to each post. If a post fits into multiple categories, add it to the most closely related one. Near misses are fine: if you create a piece of content that doesn't perfectly fit any of your categories, just add it to whatever is most related. It's better to have a few tangentially related pieces in a category than to have many categories with almost no content. Plan for the future: if you write a post about something that doesn't fit any of your current categories but may be joined by other, related posts in the future, add a unique tag to it. Once you have at least 5 posts with this new tag, you can split them off into a new category. Part of the job of categories is to make your content more navigable. So, how exactly should you go about this? First, something you shouldn't do: don't add categories in a drop-down menu in your main navigation. Drop down menus aren't very user friendly and they quickly lead to choice overwhelm in a navigation menu. If you have a sidebar on your blog, that's a good place to add a categories list. A secondary navigation menu on the blog, listing categories can sometimes also work. Another way in which good categorization can improve navigation on your site is through related posts widgets. Themes and plugins that let you display related posts at the bottom of articles will usually choose those posts based on categories. Finally, keep in mind that you can manually link to a category page. For example, if I mention that at Thrive Themes, we constantly update our products and release new stuff, I may add a link to this category page. Now that we've dealt with categories, let's also take a closer look at tags and how to best use them. My first rule for tags is to not use them for site navigation. People used to have tag clouds on their sites (sometimes even animated tag clouds... *shudder*). These have thankfully gone out of fashion. Tags are generally not a good way to facilitate navigation. There's usually too many of them and there's no good way to display navigation of a ton of items without any internal hierarchy (remember: tags cannot be structured with parent/child relations like categories). On various social platforms, tags have their uses, but I recommend you keep them as a backend only thing for your website. Add ToFu, MoFu, BoFu tags to your content, to indicate which segment of your audience it's aimed at. Create a "no optin" tag to use with Thrive Leads, for posts where you don't want your usual lead generation forms to trigger. Add tags like "video" and "audio" to quickly find all posts that contain a certain media type. Add tags based on your content marketing strategy. For example you might have "case study", "story", "news", "tutorial" and "promotion" tags and use them to make sure you keep publishing these content types at a certain ratio to each other. Some related posts widgets may also take tags into consideration. In that case, you can use tags to help fine-tune the related posts recommendations. Unlike with categories, you can add as many tags as you like, to each post. However, the "no orphans" rule applies for tags as well: there's no use having 100 tags on your site when 50 of them contain only one post each. Make sure that your tag pages are not indexed. Indexing your tag pages creates a ton of redundant content on your site, which just has to be rel:canonical'd back and forth. There's probably no negative impact from this (as long as the canonicals are in place), but there's certainly no benefit from having all these tag pages indexed. Now that you know everything there's reasonably to know about categories and tags, let me show you some ways in which you can "wrangle" them on your site, without causing issues. How did you like this content? Do you like a geeky deep dive into a topic like this? Are you going to take action and make some changes to your site, based on this? Let me know your thoughts by leaving a comment below! I know I have said this before, but I need to say it again. Thank you so much for all the great content and training you provide through each of your blog posts. This one in particular was great for me. How did you like this content? Do you like a geeky deep dive into a topic like this? Are you going to take action and make some changes to your site, based on this? R// You bet I will! 1- Generally speaking (this is just my case) I feel a little overwhelmed about the tags feature. Is it ok to have my website work only based on categories and don´t use tags? 2- Do you have any additional tutorials on how to build custom categories pages?…perhaps using Thrive Architect. Thank you so much once again for all your help. 1) Yes, you can safely ignore the tags altogether. 2) We don’t have anything on this yet, no. It’s on the to-do list, though. Headings should always be a conscious choice, they are important for SEO. They are telling search engines key information about your content. I keep finding surprise H-tags in templates I tried to use. It would be nice if they were changed out from those existing ones, but at least don’t use them in the future. Especially since it can be difficult to find where I need to click on some of the components to change them. Thank you for your feedback! The team members who build the pages aren’t well versed in this kind of thing, but we are continuously adding to our processes and training to make sure small details like these get polished up in our templates. I can’t speak for everyone, but for me, it’s been faster with Thrive Themes (I use the “Squared” theme). I knocked the seconds down even more with WP Fastest Cache (paid version) and MaxCDN. Thanks for sharing your experience, Justin! That depends on your theme, mainly. 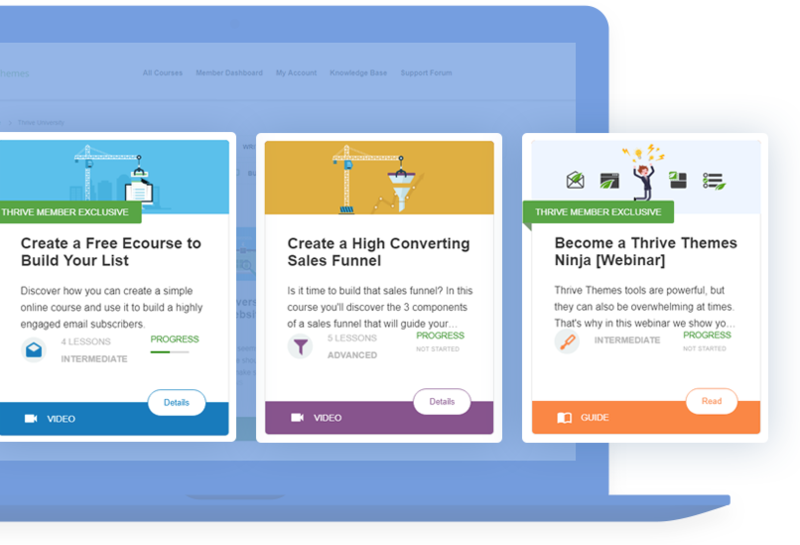 A Thrive Architect landing page will be faster than most default theme pages. But if you use a really fast theme, then maybe the default page will win out. Thank you for your feedback, Bryce! Any suggestions of what other topics you’d like to see covered like this? Thanks for the concise information – this cleared up a lot for me! Even if WP is not exactly the core of your TT business, once again you give a great value Shane. Thanx to share your experience. As always, great video, Shane :) Thanks for creating this in-depth educational content. Much appreciated! Very informative and clear explanation, thanks. Will be implementing on my site! Great information Shane. Thank you. But to be honest, my favorite part of the video was the changing lighting. It looked like you were sitting in front of a large window at street level with traffic rolling by. Added some personality to the video. Bravo. Thanks for your comment, Ben! That’s indeed what was happening. I shot this in a bar, during daytime. My favorite topic of Shane’s videos was the “Random behind the scenes question,” but unfortunately that’s long gone! Hello Shane, thanks for content. If you build a page structure under menu categories using a plug in such as nested pages does this work as well from a SEO point of view? I’m not familiar with the plugin you mention, but I doubt that this will convey an SEO benefit. Remember that if posts are represented on multiple index pages (as they will with nested categories), the right way to structure your site is to use canonical tags to always link to the original post. This is to signal to the search engine that it’s not duplicate content on your site, but just the same content referenced through different pages. This is what’s expected of site structure nowadays, so more categories, more tags and more nesting don’t lead to better SEO. Thank you for this. Very clear, helpful and many things I did not know. Egads! I thought tags were for SEO and I should try to have as many as possible on each post that related to things people might search for, so I’ve made up different tags for every post, sometimes overlapping, but not aiming for that. Therefore I also have had them be visible on the page. It sounds like this isn’t right. What I hear you saying is to use the same tags over and over and not have a million different tags. And to use them on the back-end only for organization. Do they help with SEO in some way? I think you were just working on outdated information, there. 10 years ago, using tons of tags could indeed provide an SEO benefit. Every tag you create leads to one new index page on your site. Before search engines were very good at picking out duplicate content, content relevancy and so on, it could help you catch some long tail traffic to have each post you write represented on hundreds of index pages for different keywords. Those days are long past, though. Now, there is no SEO benefit to tag stuffing. The best practice is to no-index your tag pages and use canonical URLs, so that no matter how many of them you have, they all point to the original post URL. Hi Shane, maybe off-topic, but what is a canonical URL and why should I bother? A canonical URL or canonical tag is a line of code on your page that tells a search engine “I’m just a reference to a page on this site, the original page is this way”. If you think of a category page that lists all of your blog posts, the canonical is a way to let the search engine know: this isn’t a bunch of duplicated content, this is just a reference or navigation page. It’s good practice for SEO and there’s not much you need to do for it. I recommend installing the Yoast SEO plugin and using its default settings. Awesome and hugely informative thanks Shane! And obviously a lot of work and commitment to produce two good easy to follow tutorials. One Q, some sites have blog within their urls (eg https://site.com/blog/article) whereas yours et. al. don’t. Is there a good reason to include blog within the url? Thanks and keep up the great work!!! Hello Makere. I believe there are two common reasons for a persistent “blog” in the URL (either site.com/blog/article or blog.site.com). The first is when the blog portion of a website uses a different CMS than the rest of the website. For example a business may use custom built pages for their homepage and landing pages etc. and use WordPress for the blog and using a sub-directory or subdomain just makes it easier to run two CMS for the same site. Another reason could be for the clearer separation of blog and rest of website. This would be more of a user experience thing, wanting to give visitors a very clear signal about which part of the site they are on. In terms of SEO or usability, I don’t think there is an advantage or disadvantage to doing this. Great stuff as always Shane! Thank you for being a member, Nenad! That’s awesome! Thank you for your comment. Quick question about your category page (example: https://thrivethemes.com/category/features-demo/). Is this a standard template or do you design your category page in TA? Are there tips for having a good category page design? However, I see a lot of blogs where they leave the category out of the url, so that they have shorter urls (which Google seem to prefer). I think it extremely doesn’t matter. Just recently, someone told me that the SEO thing to do is to have super long URLs with lots of keywords in them. Personally, I think this is a flavor of the week kind of thing and I believe that the days where such things matter for our search traffic are long gone. We have a “category landing page” feature in our themes, which you can use to do this. So you use a page with a landing page template on it instead of using the default category page? Is that right? If so, how do I update my links to use that page? Is this is all themes? I’m using Pressive but can’t see it. It’s exactly what I could do with at the moment. Yes. When you click on a category to edit it, you’ll see the category landing page option there. I want to see what Thrive Comments can do so I leave a comment here ! You wrote: “Make sure that your tag pages are not indexed.” How do I do that? Any help plz? Easiest solution: just install Yoast SEO. It has the correct default settings for all this. Hi Shane. Thank you. Very informative and quite a few eye openers for me, especially the info about the correct use of tags. I’ll be doing away with thoughts about using them as a navigation aid. To put this into context, could you please elaborate a little more on the best structure for the following 2 options? There are 20 football teams in each of the English, French and Italian ‘Premier Leagues’. Option 1 – If I was to just concentrate on one of the above leagues and accept written articles/posts from readers/fans across all 20 teams, what categories, sub categories and tags structure would you recommend using for a website (with a blog) that is community focussed that encourages its readers to submit their own experiences of their respective football team? Where would I be best to place articles received from readers/fans about Liverpool FC or Chelsea or Arsenal FC or Man UTD (or from any of the other 16 clubs)? Would I have a ‘Main Category’ called, for example, ’20 Teams in English Premiership’ and then each team would be a ‘Sub Category’ and then perhaps each player being a Tag? Or would each team be a ‘Main Category’ with perhaps individual players being ‘Sub Categories’ and then use tags for perhaps specifics related to football? Option 2 – If I went ahead and decided to incorporate all 60 Teams as part of the same website, what structure for categories, sub-categories and tags would I then use? Finally, how would you recommend that I display access/links to all 20/60 teams on a page/post? Could I use a widget and display them in columns rather than in a long list down the sidebar? Just trying to get a sense of how best to set this up for both options from the beginning. The answer largely depends on the amount of content you’ll have. In principle, it would make sense to simply have a category for each team. However, this is only true if A) you get a steady stream of content in each category and B) viewing an index page listing all content for a specific team is useful for your readers. If you don’t get a large amount of content and you have a category for each team, that just means tons of orphan pages and navigation links that lead to disappointing results. This is something I can’t answer for you, but think about what makes most sense for your visitors to sort content by. Maybe by team isn’t the best way. Maybe it would make more sense to have categories for match recaps, player profiles, news etc. and just use the teams involved in the post titles. Some great tips I will start putting to use with regards to the tags on my site. I have a site with podcast so used dual tags for those pages. One “podcast” and the other the general category of the topic in the episode. This was mainly so I could use category widget to create a page called /podcast and make list of latest episodes. Is it a big knock on SEO to dual categorize? This depends mainly on whether you have only podcast posts on your blog or a mix of podcast and non-podcast episodes. If you have only podcast episodes, then a “podcast” category isn’t necessary. Your blog is basically the podcast category. If you have a mix, then using a “podcast” parent category with some child categories can work. Or you can use tags. There’s no one-size-fits-all solution I can offer you here. It depends on what your content mix looks like and whether you want podcast episodes listed alongside non-podcast content on category pages. So, to answer your question, think about what you want a category page to look like and how you want users to navigate and find specific types of episodes. Shane, great information – thanks! I have a question about a different use for tags. I’m designing a gardening membership site which will include a lot of content – from larger courses to brief tutorials. Members will be able to search a number of categories to locate content related to specific broad topics. But members may also want to search for any content related to particular vegetables – and this content may be located in several different categories. So I’m considering using tags for the vegetables, to allow members to search for all the related info on specific crops. Do you feel this is an appropriate use for tags? Do you have any other suggestions instead? Hi, Shane. As a beginner, I’ve found all Thrive videos invaluable. This video came just in right time. I’ve just started and have been struggling with site navigation. I put all my categories in the main navigation. I have 5 categories, under every category there will be some posts and you can access these categories from header menu/main navigation. Is it a bad idea or it doesn’t actually matter? Thanks for your comment, Gert. I don’t recommend putting your categories in the main navigation. These category pages are not important enough for such a prominent position. The main navigation is better suited to link to some optimized landing pages like “About” (helps visitors get to know you and connect with you), “Products” (where people can buy your stuff) and so on. Great tutorial. I do have a question though. Is there anyway to customize category pages? Say I want a hero section with the category title and specific optin? or just make a template for all category pages? If you’re using a Thrive Theme, you can create custom category landing pages. You can find these options by going to Posts -> Categories and editing an individual category. one of the great Blog on WordPress. iam a beginner of WordPress through your blog i updated my knowledge on categories and Tags ,Thank u for Guiding us. keep Regular updates on blogs. Thank you! I’m happy you found this useful. What makes your videos, articles and tutorials differentiated from the rest we find on the web is that you are very clear, objective and extremely didatic. My gratitude for such useful and helpful contents, Shane!